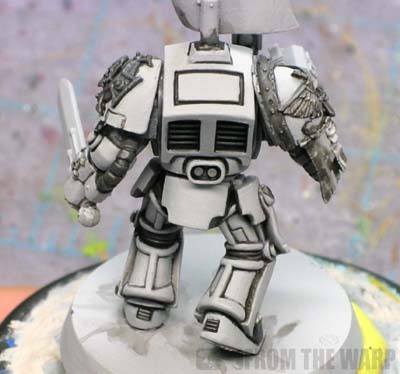 Alright, I'm going to cover the whole process I go through to get the bone color you saw on the Deathwing terminator squad I posted the other day. It's not a terribly difficult process, but it does take a considerable amount of time to do. You'll need plenty of patience to get through this. For the purpose of this tutorial, I'm limiting it to the armour itself. The remaining elements can be finished off to your liking. If you're going to try this, I'd suggest giving it a good read through to the end as I had to skip around some explaining things and you'll want to have a good idea of the whole process before starting. It should go without saying that there are dozens if not more ways of getting a "good bone color" for your Deathwing. It really is a matter of personal preference. This method came about out my searching for a bone color that wasn't so warm looking. It started as an experiment that I've kept working on for the past year or so. NOTE: I've listed the exact colors for those folks looking to duplicate the effect. Naturally you can swap out any of the colors/brands/steps to alter the final result to something you like better. 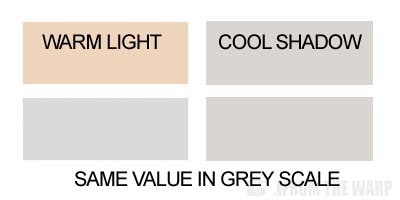 The only thing you need to keep in mind is the values of your warm and cool armour colors. They need to match for this to work correctly. Start by priming with the ColorPlace Automotive Grey Spray Primer. This gives you the base that everything builds from. If I were to sum this whole thing up in a single sentence, the idea is that we're going to do a split (two-color) basecoat on the model giving the illusion of being lit from above while the rest will be in "shade." Here you can see our two armour colors (the warm and cool) and how they match up when we look at them in greyscale. While they are not absolutely perfect matches, they are close enough to pull off the effect without any troubles. These two colors give us the split look to the model. The models are wearing the bone armour we all know they have, but it's painted either highlighted or shaded. We never really just paint the regular armour color, we use our imaginary light source to define it through light and shadow. The first thing you'll need to do is take your GW Adeptus Battle Grey and block out all of the darker elements that are NOT the armour. Things like the flex fitting in knee joints, power cables, helmet lenses, everything extra outside of actual armour plates. Once you have all those elements blocked in, go over everything with the GW Devlan Mud wash. You need to make sure you hit all the recessed areas on the model with the wash. This is what is going to define the individual armour plates later on. You can see I was a bit sloppy, but no so much that I made lots of extra work in cleaning up the model in the next stage. 2. Clean up the armour plates. Here's where you go back in with the Americana Slate Grey and clean up everything. This is why it pays to be a little neat in the previous stage. 3. Add the "bone" color to the armour. This is the stage where the GW Dheneb Stone is added to the model. Now I know I skipped over stages two and three for all intents and purposes, but here's where we go back over them in depth. At the end of stage two, your armour should look like this. All of the armour plates should be nice and clean and have a smooth coat of the Americana Slate Grey. Having primed the model with the exact light grey color, it will make the job much easier since both colors match. You can leave your non-armour elements the GW Adeptys Battle Grey and leave the GW Devlan Mud wash showing only in the recessed areas between all the armour plates. Making the transition to the third stage can be the tricky part. We are taking a zenithal lighting approach to this guy. If you hold your model so that you can look down on him, you'll get a good idea of the areas that are going to be painted with GW Dheneb Stone. This is the view you're looking for... not directly overhead, but not down at model level either. We are only going to paint the visible plates seen at this angle. Then we turn the model and look each side and the front and repeat the process. That means no GW Dheneb Stone will be painted onto the back of his left thigh as it cannot be seen from this angle. We are trying to mimic how light will fall on the model from this angle. On his right thigh, we'll paint just the outer portion of his thigh that is not covered by his hip armour plate. The inside portion is not visible. EXCEPTION: If you're painting the model and you come to a spot that is painted accurately for the light as it would fall on the model, but it still doesn't look right to you for whatever reason... you can adjust it as you see fit. This is where you'll have to use your judgement. I ran across one or two of these spots in the whole squad, so it's not something you'll have on every single model. And be careful when you adjust things. You don't want to alter the effect and create more problems than you solve. And once you have the Dheneb Stone down, you're just about done. You can see the model above has the warm color on the top where the lighting would hit it and the undersides are still all the cool grey color. Getting the Dheneb Stone onto the model is the hardest part of this whole process since you need to blend (either by layering or wet blending) every single armour plate that is affected by the overhead light. I chose to do wet blending as I can do it faster than trying to layer a number of coats of Dheneb Stone across the surface of each model. 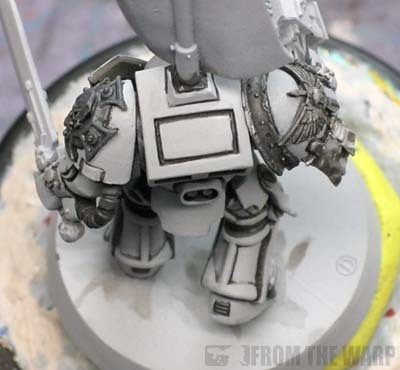 Using the P3 Menoth White Highlight, you edge or line highlight a few of the more prominent edges of the model. These will fall on the Dheneb Stone portions of the model since we are still using our zenithal highlighting approach. It doesn't have to be much, just a bit here and there to define an edge and make it pop out. At this point, you'll have a finished model (in terms of armour) that you can weather to your liking. You can see on the pic above that I only hit a few key spots to give the armour a sharper look to it. In terms of weathering, I probably go a bit heavy. For these guys, I used a number of quick and easy techniques to create a variety of effects. 1. GW washes for stains and spills. In some places where liquids might drip down from joints, bolt heads or connection points, I added a few streaks using a wash.
2. Weathering powders. I used these in a few of the deeper recesses to simulate the buildup of dirt and some rust on the armour. In particular, I used black around their feet and a series of browns where dirt and grime would build up most (knee joints and the neck area of the suits). 3. Chipped and scratched paint. Starting off with GW Chardon Granite, I take a small brush and use this effect around outward joints on the armour. Places where the armour would rub against walls, the ground, doorways, etc... If it gets too heavy, I take the base color the chipping is done on top of (either the warm bone color or the cool grey shadow color) and remove some of the effect. I've found that less is more here. You don't need much at all to make the suits look fairly beat up. In areas with considerable chipping, I'll go back over the Granite color with GW Boltgun Metal to show the chipping and damage is down to the metal. And there you have it. Yet another labor intensive way to paint Deathwing bone armour. 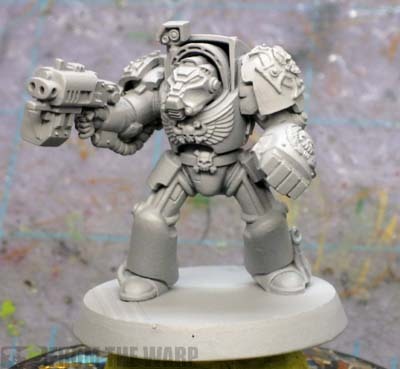 I guess it's not too hard since Deathwing armies are generally smaller in size like Grey Knights and you can paint the other portions of the model fairly quickly to get a complete look. I can tell you that this technique will scale up to dreadnoughts, but I know that vehicles may prove difficult given their wide open flat spaces. Not impossible, just a little more difficult. Thanks for posting this Ron, it is really helpful to see the process broken down and reassuring to see that my own approach is similar in places. I'm also a big fan of the P3 menoth white as my top highlight for Deathwing. I did a Deathwing Landraider Crusader a few months back, again using a similar approach. I'm still refining my technique, but I'm pretty confident this way of painting Deathwing will work for larger vehicles. Any chance we get 'the' Deathwing painted up by you? I am wondering why you are using Menoth White instead of Bleached Bone? Which way am I too read the grey scale thing? The two bottom rectangles are different greys, but the two right triangles [which are the same grey] are differentiated by the top one having 'cool shadow' written on it. Marshal: I find the Menoth White is a much sharper off white than bleached bone, so the highlights are crisper. For me, it works perfectly with the reaper bone colours I use for painting Deathwing. Also, I prefer the consistency of the Menoth White to the GW Bleached Bone. I find it much easier to use for fine highlighting work. Marshal: I am tempted to try my hand at the "traditional" look, but I find the cleaner, uncluttered models to be better looking sometimes. I do like the background info that you're talking about though, I think it's the richest stuff out there. The Menoth is a bit brighter than Bone and it's not as saturated. I wanted just a touch of a line highlight without going all the way up to white. The grey scale picture may not work exactly the same on all computers depending on how each ones are calibrated. The idea is that the top row are the actual colors. The bottom row is the same two colors in grey scale only with no hue. There are slightly different, but close enough that they are the same in terms of what I'm trying to do with this technique. You want the colors to match in terms of value for the effect to be pulled off. you know, I've been looking for a good bone colour scheme for my Death Guard Terminators. My idea was to paint them Bone and then grime em up through washes and weatherings. This might just be the one I've been lookin' for. Lookin Sharp as usual, Ron. Thanks for the tutorial Ron, these look awesome! Evan: Just know that it's going to take you some time to get it done. The transitions need to be super smooth for the effect to really work. If you do use it, send me some pics! Beautiful Miniature. Like the used wear of the Armour. I've been working on my weathering and I'm slowly improving. I've actually picked up a few more tricks since I've painted these guys. I commented about the Warbringers not long ago and failed to mention that I find your work inspiring,I wish my skills were on par with yours. 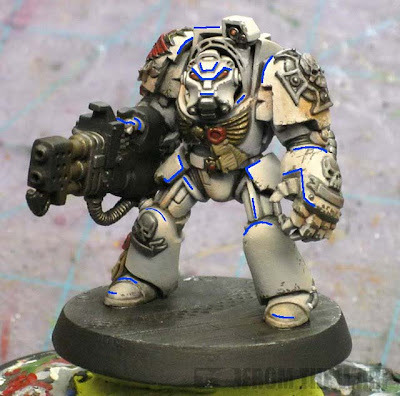 Which brings me to my question,in a quest to better my painting I've decided that I'll paint my Deathwing to match yours.The question is,do you think that Americana acrylics will work in an airbrush/spray gun (to be specific the Citadel spray gun)?? Of course I'd be thinning it down with flow improver but wanted to see what your thoughts were.I live in Australia and Americana paints are available (slate grey is available only in 8oz. size though.....) but I didnt want to have to buy so much paint and have so much left over just to test out an idea. I looked around for Colourplace Primer but they mustn't import it into Australia,hence the reason for the slate grey priming. Troy: Hmmm... very good question. To be honest, I have no idea. I suspect it would wok with the correct thinning and flow improver and whatever else is needed and such, but I do zero airbrush work and any answer I give is pure speculation. Thanks for your time,and no need to apologise,I'll give it a bang and see how it goes,I'll let you know how it turns out (I'm sure I'll be able to use the slate grey for terrain or something if it fails).To be honest most acrylics from experience are the same except for 'poster colour',only diluted to different consistencies in the tube/pot.Does Americana flow like Citadel straight out of the pot was the question I should have asked?. Also would you like to see my Lion El'Jonson (based on the new Scibor Lion Knight) and Belial WIP's? Troy: Please do, I'd love to see how they turn out. As for the Americana flow compared to GW... I'd say they are very, very close. Almost the same. If anything at all, the American might be ever so slightly thicker, but it's only by a hair. And for your final question, YES! I'd love to see some models. Ron, awesome stuff, inspired me to get going on the deathwing I want to build in advance of the new 6th ed DA codex. Question - I used an airbrush with successively brighter metallic over black for zenital lighting on grey knights. It seems as though adding the dheneb (or an airbrush friendly equivalent) over the grey with an airbrush in the same way would work here. Do you see a problem with doing the non armor painting and washing after adding the zenital dheneb? Would you do the first badab wash before hitting it with the airbrush? Anon: Thanks. 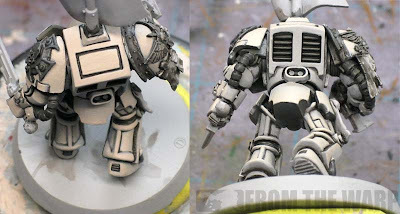 The grey is the cool shadow color to contrast against the warmer bone colored armour. The pics have a tendency to blend the two colors since the gradation is so subtle. Cool example and much appreciated. Helped out quite a bit though made use of Foundry paints in some areas as prefer these to GW. P3 nice though have to agree.